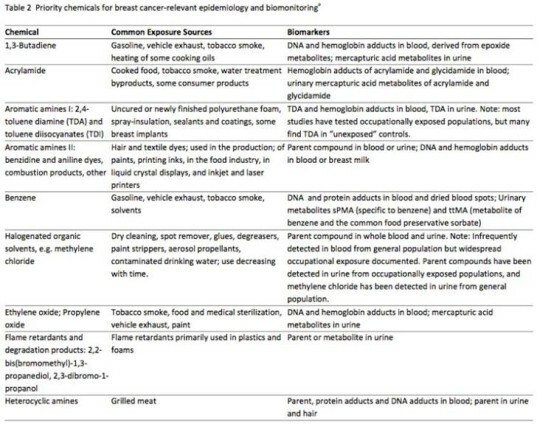 An alarming peer-reviewed study published in the journal Environmental Health Perspectives has identified a total of 102 chemicals that are linked to breast cancer. While finding out that 102 chemicals are linked to breast cancer is plenty shocking all on its own, an even more disturbing finding from the research is that most Americans are regularly exposed to these chemicals every single day. According to Silent Springs, the organization spearheading this study, they found 17 types of chemicals that should be top targets for breast cancer prevention simply because we’re so exposed, including chemicals in gasoline, diesel and other vehicle exhaust, flame retardants, stain-resistant textiles, paint removers, and disinfection byproducts in drinking water. CDC data shows that the chemicals targeted by Silent Springs are common chemicals found routinely in the blood, urine and even breast milk of American women. This study is so significant that The National Institutes of Health (NIH) is going to be incorporating the study’s recommendations into their own related Sister Study to evaluate causes of breast cancer. Keep reading to see how you can lower your risk of exposure to some of these key breast cancer causing chemicals. The above chart is an adaptation of the findings from the Silent Spring Institute. See the full list of chemical classes (pdf). Limit your exposure to fuel and exhaust. Buy furniture free from polyurethane foam or look for foam not treated with flame retardants. Use a ventilation fan when you cook. Don’t eat a lot of burned or charred food. Find a dry-cleaner who doesn’t use PERC or other solvents. Keep your home free of more chemicals by removing shoes at the door and vacuuming with a HEPA filter. An alarming peer-reviewed study published in the journal Environmental Health Perspectives�has identified a total of 102 chemicals that are linked to breast cancer. While finding out that 102 chemicals are linked to breast cancer is plenty shocking all on its own, an even more disturbing finding from the research is that most Americans are�regularly exposed to these chemicals every single day. According to�Silent Springs, the organization spearheading this study, they found 17 types of chemicals that should be top targets for breast cancer prevention simply because we're so exposed, including chemicals in gasoline, diesel and other vehicle exhaust, flame retardants, stain-resistant textiles, paint removers, and disinfection byproducts in drinking water.�CDC data shows that the chemicals targeted by Silent Springs are common chemicals found routinely in the blood, urine and even breast milk of American women. �This study is so significant that�The National Institutes of Health (NIH) is going to be incorporating the study�s recommendations into their own related Sister Study to evaluate causes of breast cancer. �Keep reading to see how you can lower your risk of exposure to some of these key breast cancer causing chemicals.